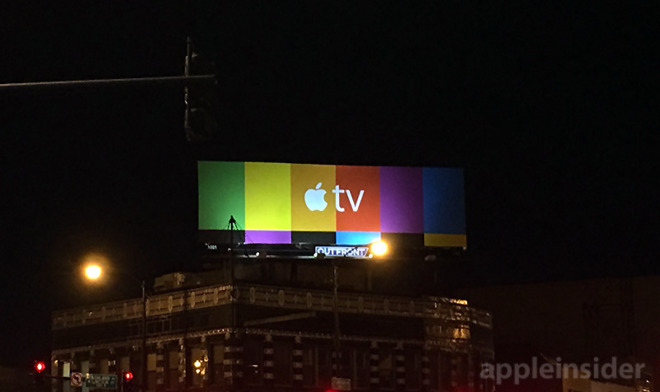 Taking its Apple TV advertising campaign beyond the small screen and into the real world, Apple is in the process of plastering U.S. billboards with faux broadcast television test patterns rendered in colors borrowed from the company's original rainbow logo. As seen in the photo, supplied by AppleInsider reader Erik, the nationwide advertising blitz mirrors a series of television commercials aired last week, each of which starts out with Apple's take on the familiar SMPTE color bars. Created to showcase Apple TV's selection of tvOS apps, the six spots feature 15-second clips from popular games like Crossy Road and video streaming services like Netflix and HBO. The latest Apple TV commercial, for example, shows a snippet from "The Muppets Show" as seen on the WATCH ABC app. While Apple has in the past relied on billboards to advertise its products, the company broke new ground with this year's "Shot on iPhone 6" campaign. Instead of blowing up professional product images, Apple scoured the Web for beautiful photos shot by actual iPhone 6 users. Shot on iPhone was later expanded to incorporate videos on the Web and went on to win multiple Cannes Lions awards. 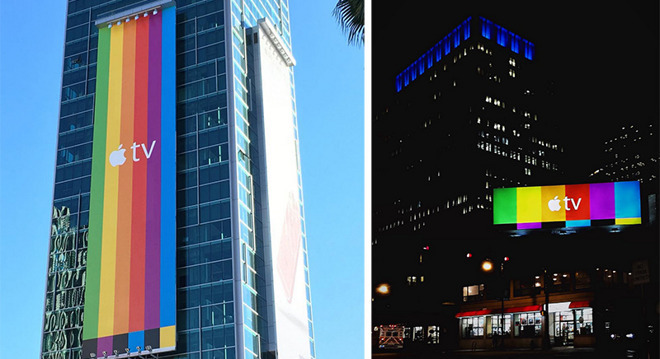 Apple most recently turned to billboard advertising to tout Apple Watch and Apple Music. The fourth-generation Apple TV was announced in September alongside iPhone 6s and iPad Pro, with the first shipments arriving in October. The current version sports Siri integration, a new touchpad remote, a full-fledged App Store, onboard storage and powerful internals running the all-new tvOS.